This article appears in the latest Sports & Activities Magazine. 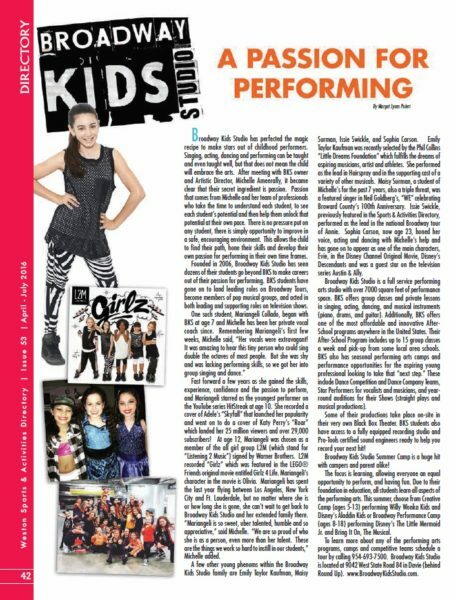 It highlights Broadway Kids Studio’s secret to success and some of the accomplishments of our outstanding students. We are once again honored to be recognized for our hard work, dedication and passion for teaching the performing arts! Come experience that passion yourself at our 2016 Summer Camp. Click here to learn more! PreviousPrevious post:Auditions!!! Songs for A New Love 2017NextNext post:2016 Summer Camp Shows Announced! November Newsletter (Holiday Edition) – Upcoming Performances, SEBI Nominations, and More!